Purchase online by paying through credit card. Install the software by downloading it from site , Click here to Download now. The software will always install in '15 day' trial mode. There is a 'Buy Now' button in the software, click that button or since you are here on the web site click now, to buy software. Follow the registration, and checkout steps. Remember this licensee name and machine code has to be carefully checked and cross checked. .
On successfully payment webpage will display activation code & an email will also be sent to you. Enter this activation code in your software, the installed software will register from trial mode to fully licensed copy. Purchase online by paying through cheque. Enter cheque details.make out the cheque as per details on the check out screen.. Post cheque to company address, on the check out screen. Email will be sent to you when cheque is cleared along with activation key. Purchase off the shelf from retail outlet. From the CD in the Magic Card Kit, Install the software. Alternately you may also download the software from this site, Click here to Download now. 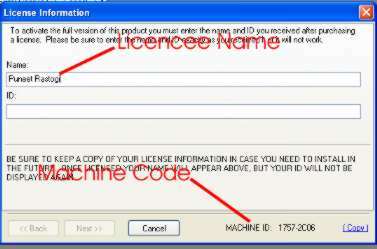 Remember this licensee name and machine code has to be carefully checked and cross checked. Do Not Select any payment options. Scratch the back of the magic code card you purchased. Enter the magic code, in the discount voucher screen. Continue checkout. If the magic code is valid, your Invoice value will automatically be reduced to zero.. The Software is designed and Licensed to be used on a single machine. It is locked to a hard disk for which the License / Activation code is purchased. PLEASE NOTE , IT CAN NOT BE TRANSFERRED FROM THE HARD DISK FOR WHICH IT WAS PURCHASED, ON TO A NEW HARD DISK. IF YOU LOOSE THE HARD DISK, YOU LOOSE THE LICENSE. read below, what is machine code and what is activation code, before purchasing the software This is part of the terms and agreement when you purchase the software. Machine code, is a code, generated by the software when installed on aany computer. This machine code is unique to this machine, and will change if the software is installed on any other machine.So in effect the software will be licenced for this machine that you have installed. PROVIDE THE MACHINE CODE ONLY AFTER YOU HAVE INSTALLED THE SOFTWARE ON THE FINAL MACHINE THAT YOU WISH TO USE ON. The machine code is displayed in the license box on the welcome screen in case of trial version as well as on the main programme screen in the "About Box"
Magic code is a alphanumeric code obtained by scratching the magic card purchased by you from the physicall store. What will happen if I enter the wrong Licencee or Machine Code?